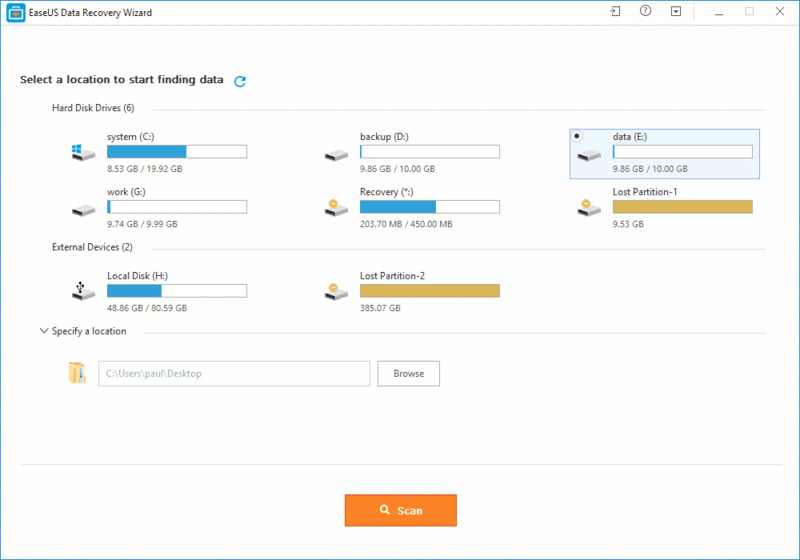 EaseUS Data Recovery Wizard is a user-friendly and simple solution to recover lost data, which offers real time solution to data loss problems ranging from - recovering files lost from formatted drive, deleted or lost partitions, software crash, virus attack , as well as restoring files emptied from Recycle Bin has never been easier. EaseUS Data Recovery Wizard Free Edition is a free data recovery software. The software supports files recovery from devices such as PC/laptop, Hard Drive, External Disk, SSD, USB Drive, Micro Card, Camcorder, Digital Camera, Music Player, Video Player, RAID, CF/SD Card, Zip Drive, Pen Drive, Other Storage Devices within a short time. 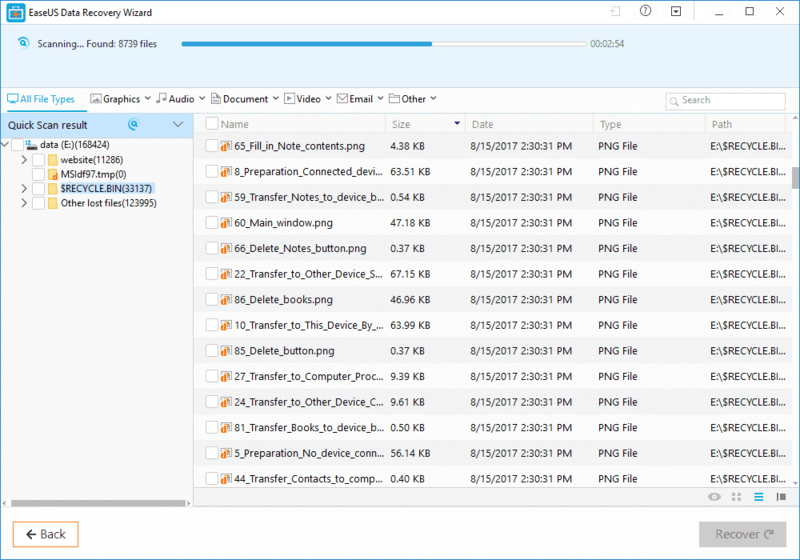 EaseUS Data Recovery Wizard runs perfectly on these operating system - Windows10/8.1/8/7/Vista/XP, Windows Server 2016/12/08/03. As well as these file system -FAT(FAT12,FAT16,FAT32), exFAT, NTFS, NTFS5, ext2/ext3, HFS+, ReFS. After installation of the software is completed, launch the software and select the folder where your lost file was and start searching. You may select a folder such as Desktop, Libraries, or Documents or you may specify a hard drive, partition, or external storage device. When you have selected the location where the data is , EaseUS Data Recovery Wizard will commence scanning. This can either be a "Quick Scan" or "Deep Scan" but the aim is to retrieve your lost data. •Quick scan - A fast scan that only tries to rebuild files from every deleted flag in a file system. •Deep scan - Automatically start right after the quick scan, which not only fully checks the file directories/indexes to find more files, thousands of files may be listed after the deep scan, but also goes through every sector on the hard drive to find RAW files to increase the possibility of a successful recovery. After a successful scan, you can then select what you want to recover from the scanning results. 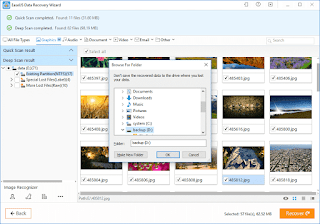 After selecting the location to restore, preview specific recoverable files before recovery, it is best to choose another hard disk or other storage location to store the recover files. With EASEUS file recovery software you can recover everything you need now. 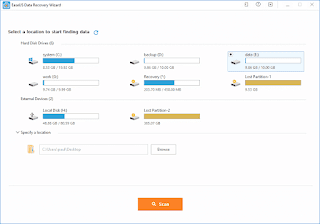 EaseUS Data Recovery Wizard has been endowed with a straightforward interface to ensure an efficient and smooth use for common users, users can instantly recover 500MB data with Data Recovery Wizard Free. CPU: with at least with x86. RAM: with at least 128 MB. Disk Space: the minimum amount of space required for the installation of Data Recovery Wizard is 32 MB. The following are the softwares Supported Languages: English, Deutsch, Español, Français, Italiano, Portuguêse, Nederlands, Svenska, Dansk, Pусский, Norsk, Polski and Magyar.